An Interview with Ben Bartlett. SV.com author George Jones had the pleasure of interviewing FA Senior Youth Coach Developer Ben Bartlett (@BenBarts) regarding his views on coaching, developing a philosophy, a constraints based approach and coach development in general. GJ: Afternoon Ben, thank you for taking part in this interview, I’m sure many of the UK based readers will be aware of who you are, but for those who don’t, could you give us a brief background of your coaching history? BB:Thanks for the engagement, George – appreciated. Have been at The English Football Association (FA) for the last 12 years working principally as a coach developer across both the grass-roots and professional game. In recent years, have driven and led key aspects of the review of the way The FA structures content, learning and assessment for coaches and we have committed to implementing positive change. Prior to that spent 12 years working for two professional football clubs; one a large Premier League Club and the other a smaller entity playing in the Football League. At these Clubs we led and delivered pathways of player development for young people across both the men’s and women’s game. GJ: Can you please tell us what your day to day job involves? 1. Commit to better understand the role of coaches working in The Professional Game. Then harness, foster & encourage their curiosity by responding with programmes of learning; supporting that learning to align with the demands of their coaching role. 2. Structure programmes of learning and development that are delivered both in central places (e.g. St. George’s Park) and in the more context rich environments that coaches work in on a day-to-day basis. 3. Research and analyse the extent to which 1 & 2 (above) are aligning with our vision & strategy and, where necessary, effect positive change. 3. Do you think that in coach education one aspect of education is better than the other? I.e, Formal learning over informal learning? They’re deeply connected and whilst it’s difficult and problematic to state which is ‘better’; it’s probably important to maintain a healthy tension between the two. Whilst more informal, relaxed individual support in context can be perceived as being more valuable in impacting upon the decisions coaches make; the opportunity to spend some time in a more formal setting, away from the day to day pressures of a coaches role, speaking with or listening to others can also be timely. GJ: Do you have a coaching philosophy? A. Dynamic systems theory – we are a collection of different ‘systems’ e.g. cardiovascular system, nervous system etc. which interact with both each other and the environment they are being exposed to. C. a & B contribute to a Constraints Led Approach to development. Any time the way we decide to play football, the player playing it or the environment they are playing it in changes; it is likely that the movement solution changes. Taking all this together, it may then be helpful to expose people to different ways of playing football (against different opposition) in varying environments (e.g. when the weather is cold (& warm), when the social/ cultural environment is ‘cold’ (& warm), when the pitch is good (less good) etc,etc etc. Coaches can observe how players respond and then decide how we might decide to support them. For example, have studied Napoli quite a bit over recent years. Under Sarri, their style was fairly consistent (4-3-3; ‘point down’, with a narrow front 3). Insigne (as the left forward) played differently from Callejon (right forward) as he (Insigne) often came short whilst Callejon (more often) stayed high. As a result a higher number of attacks took place down the left and the left back (often Rui) was advanced more than the right back (often Hysaj). Jorginho (the holding midfielder) and Koulibaly (left sided centre back) were key orchestrators in terms of establishing attacks. Similarly when Dries Mertens played as the number 9; the way the team played had some subtle differences than when Milik played in advanced positions (as, perhaps, Milik has a greater aerial presence than Mertens). Naturally, each player plays a subtly or significantly different role and the demands upon them (across the four corners) are likely to be different. Programmes of training may need to both integrate the four corners (together) and reflect the differences. Hence, recognise and critically understand that when the game situation, the player (in that situation) or the environment (that player is playing in) changes the solution probably does to. GJ: How would you best encourage a coach to come up with an individual philosophy? BB: As a start point; coach some sessions and match-days. Reflect on what we (the coach) and the players did (video and audio can help this as can discussing with the players) at those events. This is probably a reflection of what we are currently doing (and whether what we are doing is ‘who’ we want to be). A. How do we want to play football? Why is that important to us? B. What are we going to do when things are going well/less well? C. How do intend to respond with each other? This can encompass both individual player answers and collectively agreed ones. This may then become our ‘philosophy’ (way of doing things). Everything we do should probably be a commitment to aligning with what we agreed. GJ: Can you give any examples of “demands” that we as coaches can put on players to play within the coaches’ style? BB: As referenced in the previous question; it may be more impactful if it is an agreed style. The accompanying video possibly illustrates this better than many words. GJ: How would you say the FA’s approach to coach development has changed over the past ten-fifteen years? 1. Assessment. The traditional, historical one off ‘themed’ session where a coach typically set up practice to a. generate success and b. impart lots of ‘football information’ at the players. This behaviour was probably a consequence of how they had been taught and what they needed to do to ‘pass’. Unfortunately, this, for many, became what coaching was . 2. Content – there has been a greater commitment to content being a. more holistic (reflecting the whole person – not just the technical/tactical elements) and b. as a result of a. more child appropriate. GJ: As coaches we understand that player development is non-linear, I myself have often found that coach development courses can often be very linear and behaviouristic in their learning, is there a need to change coach development to follow this non-linear path? BB: Yes – 100%. We are getting busy with this; although there is already some significant commitments to enable this (as referenced in the previous question). The big challenge is the in-going development of us all as tutors to support this becoming an inherent part of how we practice. GJ: As a big advocate of the approach myself, what was it that drew you towards the Constraints Led Approach and Non-Linear Pedagogy in coaching? BB: It is a useful approach to enable processes of development to be individualised and varied. This can enable and support people to stitch their own journey into an underpinning, flexible framework. GJ: An issue that literature tends to have with a constraints based approach, (I have written about this issue on this website (Here) , is that a coach with a poor understanding or a poor implementation of the constraints based approach may allow their athletes to “just play a game” and feel they are implementing the approach successfully, what are the FA and yourself in particular doing to educate coaches to not allow this to happen? BB: All of the stuff previously mentioned. We are challenging both coaches and ourselves to be able to rationalise the decisions we are making, be supported to reflect (think about) what we did and (perhaps) adapt our approach where appropriate. Practice design is a smaller, more micro aspect of this approach. There may be times when we do make the decision to ‘just play a game’ and have good judgement as to doing so (in fact if this happens sometimes it may be better for the players). Other times we may decide to more deliberately constrain a player (or players) to afford them the opportunity to practise something more specific. If what is suggested in the question is problematic and unwelcome in a particular situation/context then that may be an ‘intervention’ that a particular coach is supported with. GJ: What would you describe as the perfect learning and development environment? ‘Perfect’? Not sure. A useful one is probably one that does what it says it is going to do. Personally, believe it is difficult for anyone to tell someone else what they should or shouldn’t be doing. Perhaps only help them better understand themselves and the players in their environment. 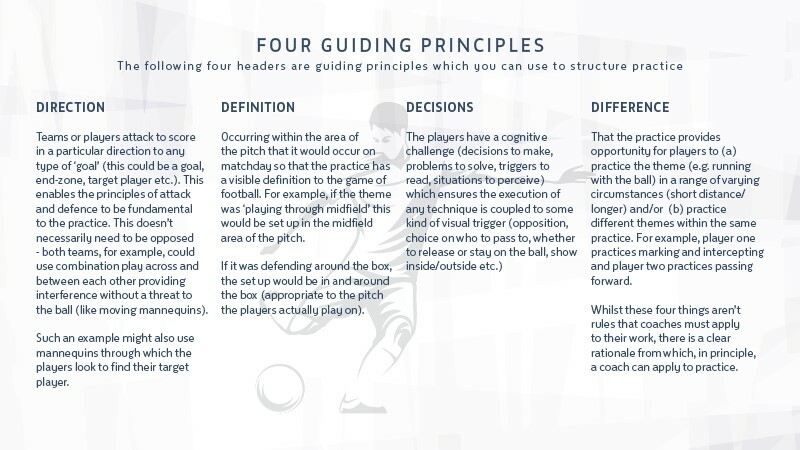 GJ: I’ve seen you talk about “The Four guiding principles” for structuring practice, can you elaborate on these and shed some light on how you came up with this? This was a commitment to seek to respond to the recipe-based nature of coaching where coaches imitate a session that someone else coached (without necessarily understanding why they coached it the way they did). Conversely, building a practice from a blank piece of paper can be daunting. 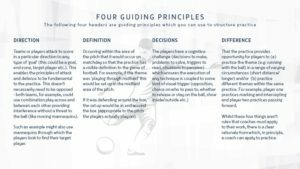 They are four principles that inform my thinking in attempting to devise practice that is representative of the game of football. Overtly sharing this is about encouraging thought as to how a coach came to deliver what they did in the way they did. This piece of work has deeper layers to It, where (if of value) coaches can use an ingredients based approach (taking account of their own and the players needs) to devise their own ‘recipes’. This can support coaches to build responsive work supported by a stable, consistent framework. GJ: Another thing that you and I have spoken about privately, (and again I have written about Here.) is a common misunderstanding between Games Based Approaches and the Constraints Based Approach, could you detail the differences? BB: As with many things it depends upon interpretation. Believe that a constraints led approach is probably a way of thinking about development whilst a games based approach may be more of a practical way of applying some of that thinking. GJ: Finally, you have spoken in the past about coaches being aware of socio-cultural constraints within their coaching, often these can be highly subjective, how would you suggest coaches assess these constrains in an objective manner in a way they can implement them in their coaching approach? BB: Socio-cultural relates to the attitudes and values in a particular environment. It is likely that a social group create an atmosphere that encourages socially acceptable behaviours whilst discouraging others. If the people are together in positively establishing and developing these attitudes and values; then it can be a genuinely positive way to impact development. In other examples the influence can be negative and controlling. GJ: Thanks again for your time Ben, have a good day.